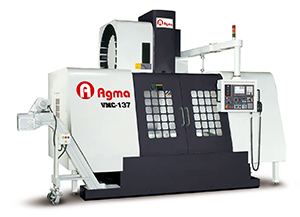 AGMA hardened-way machines are designed for rigidity and heavy-duty cutting. The machine structures are exclusively made to absorb and dampen cutting-induced vibrations; yet the machine's agility is better than most linear-way type machines on the market. In order to support our customers' needs, AGMA has built a support network specifically in special material cutting applications. This allows us to offer our clientele the best solution to their applications. Customer satisfaction is always AGMA's first priority. The cartridge-type spindle enables it to reach 8,000, or 10,000 RPM using a belt drive assembly. Bearings at spindle nose end are well supported by a shaft sleeve and casting structure. The optimized bearing arrangement along with rigid spindle headstock reduces cutting-induced vibrations, virtually guaranteeing a better work piece surface finish. The gear-driven cartridge spindle is capable of reaching speeds of 6,000 RPM. There is a dramatic increase in spindle rigidity due to increased spindle bearing support. This along with a high horsepower spindle motor dramatically enhances the machine's cutting performance. In addition, each gear-driven spindle has a spindle oil cooler used to lower bearing temperature and prolong spindle life. The chip auger design provides optimal chip disposal and maximizes table cleanness. Instead of using a costly chip conveyor, the special three chip auger system efficiently removes metal chips which produced during machining. The spindle headstock has increased rigidity due to the wide stance design of the z-axis ways and the long surface contact between the headstock and way bars. The two-speed gear transmission allows full power utilization. All gears are made of Chrome Molybdenum alloy steel, heat treated, and precisely ground to ensure the spindle runs quietly and smoothly. Furthermore, the design of the floating tool release mechanism minimizes any pressure exerted on the spindle bearings. All three axes use ISO Class C3 precision ground preloaded ballscrews with pre-tensioned supports on both ends to minimize backlash and compensate the thermal induced error. Four over-sized ways of the machine base combined with the large column helps make the structure a very rigid unit. The column is also heavily ribbed with honeycomb shape ribs to minimize any twisting caused during machining. When in operation, maximum contact surface between the spindle headstock and z-axis ways helps counteract heavy loads applied to the spindle structure. 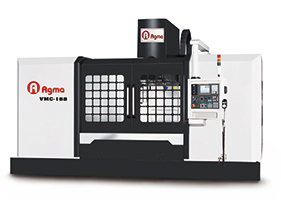 The machine base of the VMC-168 uses a unique enclosed circular structure.This unique design allows the base to remain free of deformation that may occur due to the heat generated during machining. This unique design also allows the machine to remain stable after extensive usage. Lubricating oil is evenly distributed to the sliding surfaces of the machine by using Showa oil distributors along with hard-plumbed, low maintenance oil lines. Coolant through the spindle with pressure of 20-bar (280-psi) effectively reduces tool wear because of heat and the slow evacuation of metal chips. CTS with higher pressure is also available. All of our machines are calibrated according to the "VDI 3441 3∂" standard. Calibration is performed for full travel length for each axis. Each measurement is taken six times to ensure the most consistent and accurate readings. This unit offers larger tool capacity help to increase machining efficiency. The tool magazine is stored away from the working area to reduce any interference when the machine is in operation. A rapid arm-type tool changer is driven with a precision cam, maintaining toolchanging accuracy of 0.01mm, which in turn will help maintain long-term spindle clamping accuracy. Each machine goes through telescoping ball-bar tests to check contouring accuracy and uncover any geometric errors.This testing ensures the machine structure is both square and parallel. The control panel swivels for easy use and also has a remote MPG for fast manual operations. To ensure consistent high quality , each slide way is hand-scraped. Each axis saddle has Turcite material on it and a special "*" design is used along with a "Z" pattern for efficient oil through. There is an excellent distribution of oil to all axes, so setting time after rapid movements is eliminated, and stick-slip during cutting is minimized.